Home 7mm-08 vs. .308 – Which Is Best For You? 7mm-08 vs. .308 – Which Is Best For You? Which is superior, the 7mm or the .308 Winchester? Honestly, this is not a question that comes up all too often in the gun world, and the reason for that is because .308 and 7mm are very rarely compared. In fact, 7mm is rarely compared to anything it seems. Rather, all the attention seems to be on .308 vs. 30-06 or .308 vs .270. or .308 vs 6.5 Creedmoor. Back in the day, there was previously little debate about which calibers to use for hunting. That’s because the .30-30 Winchester by way and large the most popular choice for deer hunting, and the .30-06 Springfield was by far the most popular for larger game. In fact, those two cartridges alone absolutely dominated the hunting scene for decades. But that slowly began to change as more calibers were invented and more calibers began to gain in popularity. The .308 Winchester was designed as a shorter version of the .30-06 and rose in popularity exponentially. In fact, today, the .308 Winchester is not only the single most popular centerfire rifle cartridge in the United States, it’s also the most popular rifle cartridge in the entire world. The .308 and the .30 caliber series of rifle calibers, in general, ruled the roost with the American hunting scene. The 7mm round was introduced in the 1980s, so by then, the .308 had already been dominated the hunting scene for decades. But the 7mm quickly gained in visibility, and soon most manufacturers of hunting rifles were making rifles chambered for the round much like they were the .308. Which is better? To be honest and upfront, both are excellent calibers. Both, with proper shot placement, are going to bring down just about anything in North America. So it’s not like that one of the two is going to outperform the other in regards to the ordinary shooter or hunter. But if you want to be more nitpicky and really measure the two calibers head to head, that’s what we’re going to do here. In this article, we will discuss the history and development of the .308 and 7mm before diving into the main differences between the two when it comes to their velocity, recoil, and stopping power. The 7mm-08 Remington cartridge was introduced in the 1980s. It was devised by necking down the .308 Winchester caliber’s neck, in order for the overall bullet to have a smaller diameter. What was the main appeal of the 7mm at the time? 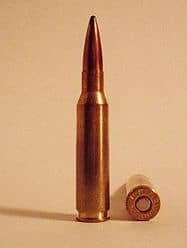 Basically, Remington intended the caliber to be able to provide lesser recoil than a .308 while still being large and powerful enough to kill wild North American game effectively at long distances. There are a wide variety of bullet weights for the 7mm, with most being in the one hundred and twenty to one hundred and fifty grain range. The .308 round was invented by Winchester and introduced to the general public in 1952. As was noted above, it very quickly grew in popularity, and eventually became the most popular rifle caliber in both the United States and across the world. 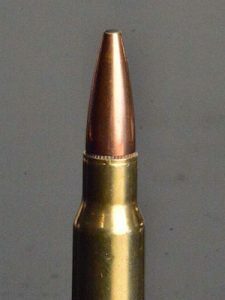 A variation of the round called the 7.62x51mm was also adopted by NATO countries, such as for use in the Springfield M14/M1A, AR-10, HK G3/CETME, and FN FAL. Rifles that are chambered for the .308 Winchester can chamber and fire both .308 and 7.62x51mm, but not vice versa. 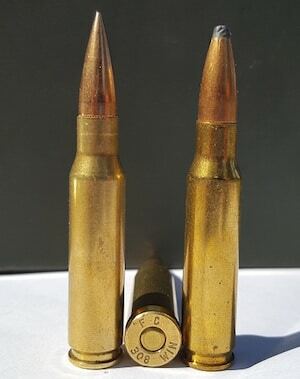 The .308 eventually came to supplant the .30-06 Springfield round due to its reputation for better accuracy (although the .30-06 certainly remains highly valuable and popular as well). Velocity is important when deciding which caliber you want to carry out in the field because the higher the velocity you have, the less impacted your round will be by environmental factors such has the wind, rain, snow, sleet, or gravity. As a general rule, if your bullet can attain supersonic speeds of at least 1,125 feet per second, then the effects of outside forces on its trajectory will be rather minimal. When it comes to the velocity of the 7mm-08 and .308, there really isn’t that much of a difference. On average, the 7mm will reach greater velocity out of the muzzle out to five hundred yards, but there are also several loads for the .308 that can equate it. What should matter to you more is the fact that both the 7mm and .308 can easily attain bullet velocities that are subsonic, which means that the trajectories of both rounds will only be minimally impacted by outside factors. Recoil is also important because it determines, for how, how easy your rifle will be to shoot. Plain and simple, if you don’t enjoy your rifle, then you won’t shoot it! Now here’s where things get complicated: oftentimes recoil is not so much determined by the caliber itself as it is by the rifle that you are shooting. For example, shooting a heavy caliber in a heavy rifle can sometimes have less recoil than a lighter caliber in a lighter rifle. In other words, the lighter your rifle, the heavier the recoil is most likely going to be. In terms of recoil by the calibers alone, the 7mm-08 round will generally create a few less feet per pounds of force in contrast to the .308. Keep in mind, the 7mm-08 was primarily designed as a necked down .308 in order to create a lighter recoil package. In general, a .308 Winchester round can create twenty to twenty-four pounds of energy. A 7mm-08 round can create seventeen to nineteen pounds of energy. So yes, the .308 should theoretically kick more. But the weight of the rifle will also play a major factor in the recoil as well. A heavier .308 rifle should kick less than a lighter 7mm rifle. Last but not least, let’s talk about the stopping power differences between the 7mm and the .308. 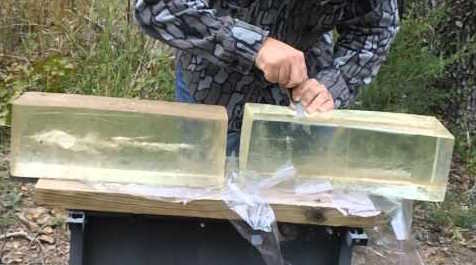 Here’s a golden rule to follow for big game hunting: you will want your caliber to generate a minimum of one thousand feet per pounds of force sin order to bring down deer, elk, moose, and bear. And guess what: both the 7mm and .308 can create that amount of power, which means that both are more than suitable for North American big game hunting. The real question perhaps is: which one is more ‘powerful’? Well, here’s the deal: the. .308 is both a heavier round and creates more energy out of the muzzle than a 7mm-08 round. The .308 can routinely create more than 1,500 feet per pounds of force, and usually, the 7mm-08 is only a couple hundred feet per pounds of force behind. But it really comes down to bullet weight and load more than anything. There are 7mm rounds with more grains of powder that can create more energy than a .308 with lighter load. In short, both the 7mm-08 and .308 have more than enough energy to bring down anything in North America, but the .308 is generally the heavier bullet. The .308 Winchester is a more popular round than the 7mm-08 and has been for many years, but both calibers are an excellent choice for hunting in North America today. Own and shoot both for years. The 7mm-08 is flatter shooting and gets you closer to the performance of the 6.5 Creedmoor and the 260 Remington that for years have been loved and used by the paper punch crowd. Sorry but in my case and in my opinion, the 7mm-08 is the hunting rifle of choice. I can carry a lighter rifle and recoil is mild. The 7mm-08 can also easily be loaded to near 3k fps with 143 gr boolits. Then it’s recoil is about as high as it’s going to get. The 308 is a popular around the world for a reason. It too is a Great cartridge.Just love my 7mm-08.